Great news! 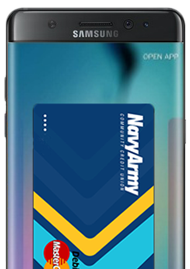 You can now use your NavyArmy Debit Card with Apple Pay™, Samsung Pay™, and Google Pay™. It’s simple, secure, and available for your personal and business accounts. Just find your device from the list below and click for instructions and FAQs. Take advantage of lock screens, passwords, and fingerprint capabilities. Make your passwords complex and change them regularly. The default settings in many accounts and apps promote information sharing. Check your account settings to ensure only the information you want to share is visible to those you want to share it with. Be wary of communications that urge you to act immediately, offer something that sounds too good to be true, or ask for personal information.